This page contains commonly used settings listed below. ‍If the Salesforce Email Opt Out field is checked on a Contact or Lead, then the Contact or Lead cannot be added to any subscriber list in Campaign Monitor. This setting is not retrospective - I.e. it will not automatically remove people from a subscriber list, it will come into effect when the 'Email Opt Out' field on a Contact or Lead is updated. When the 'Email Opt Out' is checked, the Salesforce user will see a message that says that the Contact or Lead cannot be added to a subscriber list. 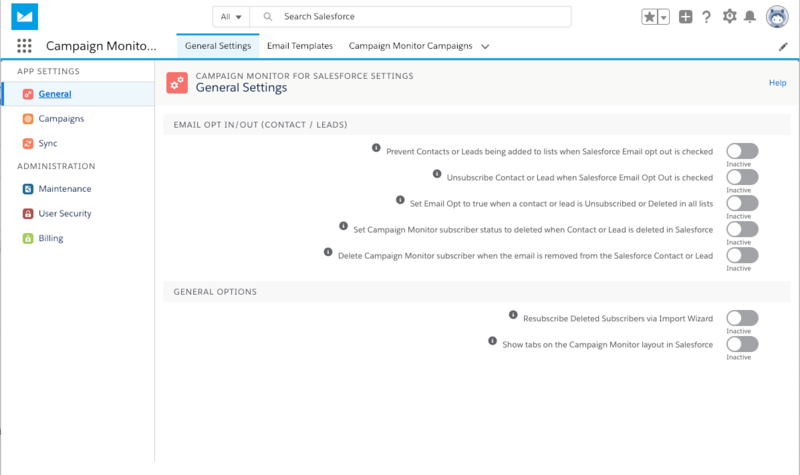 ‍Automatically unsubscribe the Contact or Lead from all associated subscriber lists in Campaign Monitor when the Email Opt Out field is ticked on the Salesforce Contact/Lead. ‍Automatically update the 'Email Opt Out' field to true when the email is unsubscribed from ALL Campaign Monitor lists. This field is updated when the primary sync next runs (typically hourly). Turn this off if you don’t want the standard 'Email Opt Out' field to be updated by Campaign Monitor to Salesforce. When enable further menu options will appear under the Campaign Monitor tab in Salesforce. Disable to hide the menu from Salesforce users. When using the import wizard, optionally resubscribe subscribers that were previously in a state of Deleted. It will not re-enabled unsubscribed subscribers. If a Contact or Lead is deleted in Salesforce, update the corresponding subscriber in Campaign Monitor (for all subscriber lists) with the status of Deleted. On the Campaign Page you can change the settings of how the application works with Salesforce Campaings. Automatically create Salesforce Campaigns for each Campaign Monitor Campaign and link the two together. Salesforce Campaigns will be created when the primary sync runs. Don't update Campaign Member statuses. Update the Salesforce Campaign Member status field each sync. Only update on the Salesforce Campaign Member status field sync once. This can be helpful where you only wanted to capture the first interaction with the email (e.g. the fact they had opened it) but didn't want this overridden at a later date (e.g. by the recipient clicking links within the email). Or where you manually set the status after the first time the user has interacted with the email. The Salesforce Campaign Member status field on the Salesforce membership record will only be updated if the Activity Date field on the Salesforce Campaign Member record is either empty or is greater than the last Activity Date. 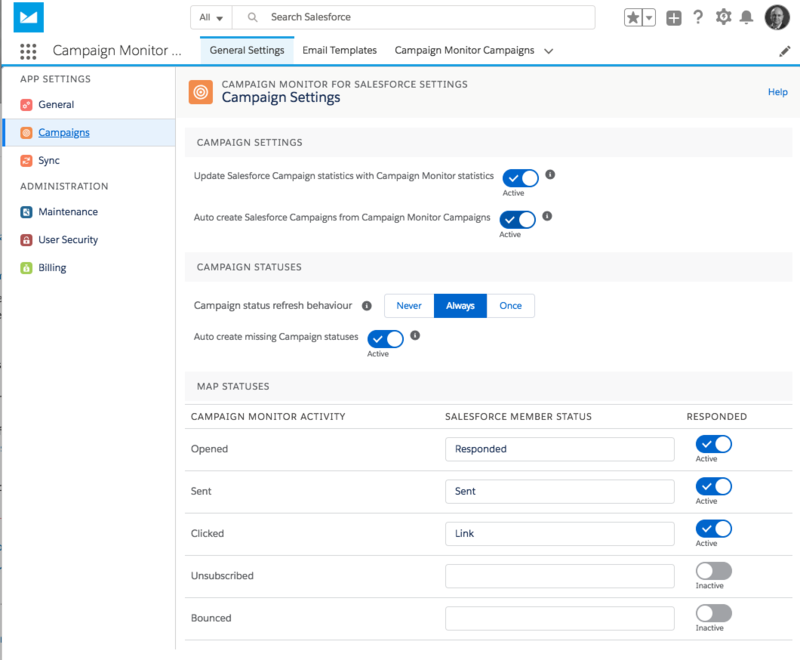 Auto create missing Campaign statuses, when active, will automatically create any mapped statuses in your linked Salesforce Campaigns. For example, if the status Clicked (under Campaign Monitor Activity) is mapped to Registered, then the integration will check if the "Salesforce Member Status" includes the item Registered and will automatically create it if it doesn't. The Salesforce Campaign member status value can be mapped to values coming from Campaign Monitor. For example, you could map the Opened status from Campaign Monitor to a Salesforce status named Registered. In addition to mapping the statuses, you can also determine which statuses count as a response from the customer. This relates to the Salesforce responded fields on the campaign (E.g. Responses in Campaign). In addition to mapping the statuses, you can also determine which statuses count as a response from the customer. This relates to the Salesforce responded fields on the campaign (E.g. Respondes in Campaign). The sync options allows you to see which Campaign Monitor account you are connected to, when the primary sync last and next runs, multi clients, and manage email tracking settings. Start the primary synchronisation job in the background. This job is responsible importing Campaign Monitor data into Salesforce. This primary sync job can take up to an hour to run, although typically it runs within a few minutes. It will sync all the records in Campaign Monitor that have changed sync the last sync. 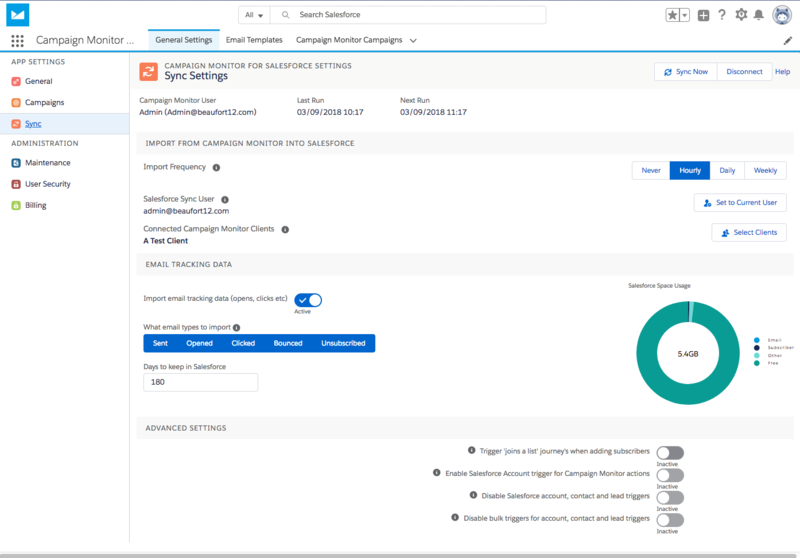 This sync does not control Automatic Subscription rules or Custom Field Mappings where the direction is set from Salesforce to Campaign Monitor). 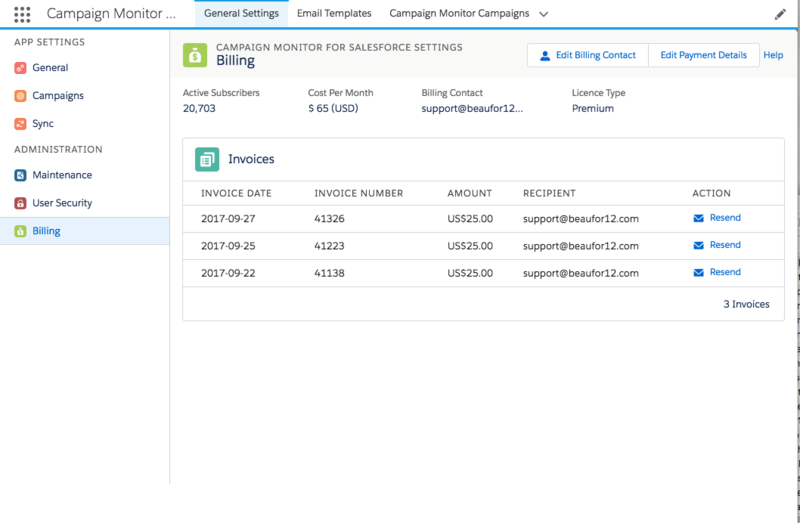 Where configured, updates to records in Salesforce are sent to Campaign Monitor in near real-time. If you want to change the Campaign Monitor connected user first click disconnect as described above. Once disconnected you can then click connect. You will be prompted with a connection screen to enter your new Campaign Monitor user details. Hourly - This is the default and recommended sync schedule. This is the Salesforce user that is responsible for running the primary sync (i.e. the background job that imports records from Campaign Monitor into Salesforce). The user is typically the person who set up the Campaign Monitor for Salesforce application. Pressing the Set to Current User button will result in the schedule being change to the Salesforce user who presses this button. Campaign Monitor can be configured to work as an agency. When agency is configured you have the option to connect to one or more Campaign Monitor Clients. Typically there is only one Client (i.e. one area where you manage your templates and send email campaigns). If you are only connected to one Campaign Monitor client, then the name of that connected client will appear to the right-hand side of this label. If the connected Campaign Monitor user has access to multiple Campaign Monitor Clients, then a Select Clients button will be visible. This allows multiple Campaign Monitor Clients to be synced at the same time. If there are too many selected clients to display on the screen, these will be hidden, but are still viewable by clicking the Select Clients button. Security is also a key factor. You can limit what Campaign Monitor clients a Salesforce users can see using an agency approach as well as what they can do. This is accomplished by creating a user in Campaign Monitor that can only see a particular client and the user can also have limited permissions. To learn more click here. When Active, the email tracking stats will be imported into Salesforce from Campaign Monitor. By default, all email tracking types (Sent, Opened etc) will be imported. Optionally deselect types to prevent them from being imported into Salesforce (tuned these values to manage storage or restrict what Salesforce users can view). Set how many rolling days of tracking data to keep in Salesforce. Any tracking data older than the number of days specified by this setting will be removed from Salesforce (but the data will still be available in Campaign Monitor and can be re-imported into Salesforce at a later date if required). Enable this setting if you want to bulk start journey's when importing records from Salesforce to Campaign Monitor. Use with caution as this may trigger emails to be sent to all recipients in the bulk import. When bulk importing records, they may still start a Journey if the subscribers enter a new segment (e.g. a custom value is updated as part of the import which results in the contact entering a new segment which in turn can start the journey - regardless of this setting). Enable this setting if you have subscription rules or custom field mappings that reference Salesforce Account fields. When an account record is updated, this will then trigger the subscriber rules. This disables Campaign Monitor triggers in Salesforce. This prevents automatic subscription rules, custom fields mappings and email opt out functionality. Typically this should be set to 'Inactive'. This disables bulk Campaign Monitor triggers in Salesforce. When enabled, only the first modified record in a batch transaction will be processed (E.g. by automatic subscriptions). The Maintenance page allows you to setup or remove page layouts, reset stored data and view system messages. When the application is first installed into Salesforce, the page layouts (buttons, fields, related lists etc) will be automatically configured (unless the setup is cancelled). You can remove page layouts or add them back. This article explains how. This area allows you to refresh the Campaign Monitor data (subscriber details, email tracking statistics, list details etc) stored in Salesforce. Refresh configuration data. E.g. Subscriber lists manually created in Campaign Monitor. Full refresh the Subscriber list members record. E.g. the email address and status. Full refresh of all the email tracking data. E.g. opens, clicks etc. Click Reset Data (it's safe to leave the page and come back to it later). Typically you would reset data if there were missing or incorrect email statuses, email tracking data, subscriber list members (E.g. because your Salesforce org had previously run out of space and the sync had stopped for a while and now the data needed to be refreshed). 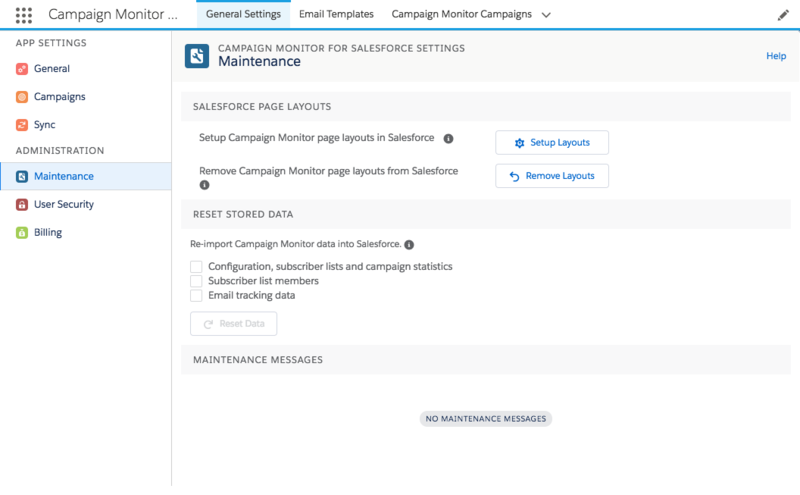 Campaign Monitor for Salesforce system messages are visible in the Maintenance Messages. This is the first stop when troubleshooting. If a record cannot be synced from Campaign Monitor to Salesforce, a message will appear here (e.g. field has been mapped data to a restricted picklist field in Salesforce such as a country). Use the inline menu to view more details about the message. Click on the Code field to view more information about the message on our support site. The billing page allows you to manage billing details, view invoices and resend them. For more information click here for our full article on Billing.